As consumers continue to become more aware of where their food comes from and how it is grown and prepared — think organic tomatoes, fair trade coffee, locally distilled spirits — their eyes are also being opened to the exotic colors, intriguing flavors and fascinating textures of good old sodium chloride. SaltWorks Inc. of Woodinville is carrying the artisanal banner high. The 13-year-old company sells 110 salt varieties with names like Snowflake, Pacific Blue, Pure Ocean, Cyprus Flake and Hiwa Kai. There’s a Smokehouse Collection of all-natural, wood-fired sea salt available in three levels of hotness: Bonfire, Wildfire and Hellfire. There’s also an artisan line of all-natural Fusion sea salts with taste profiles like Spanish Rosemary, Lime Fresco, Espresso Brava and Habanero Heat. You can buy it by the jar, by the truckload or in multiple oceangoing containers. 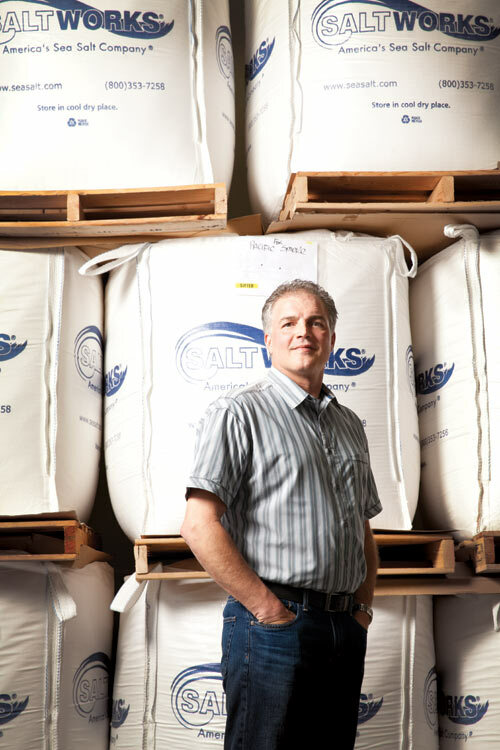 SaltWorks’ customers range from individual consumers and restaurateurs to grocery chains, food processors and salt-mill manufacturers. Founded in 2001, SaltWorks now has 70 employees and has become the largest gourmet salt business in the world, with revenue this year expected to reach $22 million. The co-owners of the privately held firm, Mark Zoske and Naomi Novotny, continue to seek new customer relationships and taste innovations as they consider expanding yet again in the next five years. In Seattle’s University Village, Mrs. Cook’s kitchenware and culinary supply store has been selling SaltWorks items since 2009. Shoppers seem to like its new take on an old ingredient, says buyer Amy Pomp Lorette. “You really can develop a palate for the differences in taste and texture,” she says. Among the better sellers at Mrs. Cook’s are Salish Alder Smoked Sea Salt, for its Northwest connection, and Fleur de Sel, as an all-round finishing salt. Saltworks’ own story has it starting out as Zoske’s hobby. Consumer interest in innovative products and high quality persuaded him that there was a business model to be honed. Energetic customer service and aggressive marketing have set the company apart, say clients, and today, the company retails, wholesales and exports gourmet sea salts as well as bath and spa salts. It also harvests its own sea salt from the waters of the Strait of Juan de Fuca and offers an all-natural line of smoked and flavored salts with no additives or anti-caking agents. At the other end of the customer spectrum, SaltWorks (seasalt.com) has several large clients Zoske cannot name because of nondisclosure agreements. Among them, according to a recent Evening Magazine story on KING-TV, is a “large” Seattle coffee company, which reportedly uses a SaltWorks product for its salted caramel mocha. Evening Magazine also mentioned La Panzanella Artisanal Foods Co. and Sahale Snacks as SaltWorks clients. Zoske and Novotny, business partners since 2002, married four years ago. He is CEO, she is president; together, they now focus on mechanizing both their processing and shipping operations at the 130,000-square-foot site not far from Woodinville’s wineries and tasting rooms. The company has already expanded once, but annual revenue growth of 35 to 40 percent has the couple looking for a larger site where they can build a 250,000-square-foot headquarters and plant. Saltworks’ rapid growth could be further enhanced by the continuing trend among large food companies toward using sea salt as a key seasoning agent. Wendy’s sells natural-cut fries with sea salt. Kettle Foods has sea salt and vinegar potato chips. Most high-end chocolatiers offer some sort of sea-salt-and-caramel pairing. Zoske predicts that McDonald’s could soon put sea salt on its French fries. The company continues to grow its customer base of retailers and bulk buyers, who may use SaltWorks salt as an ingredient or may repackage and label certain varieties for resale as their own.